Wanted: songs for a beginner guitar player to learn, master, then take on the road during (very distant future) world tour. Must be catchy and suitable for a female voice to sing along to. Acceptable chords: G, C, D, and E minor. 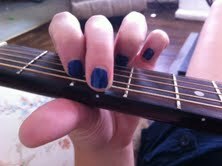 F-chords-heavy songs need not apply, as my hand currently hurts just thinking about forming it. B-heavy songs will be considered on a case-by-case basis. Preference will be given to happy songs and anything by Josh Ritter. Send proposals to lorithebrave@gmail.com or comment below. Well, the classic is obviously “Smoke on the Water,” but I would also say “Californication” for something in this century (or was that 1999?). RHCP, nice. I’ll have to see if it’s up to my standards (ei, if it’s easy enough for me to master). Thanks for commenting!